In October 2013, 75 hectares (just over 90 full sized football pitches) of arable farmland came back in to National Trust ownership from an agricultural tenancy. This land was once part of the large Northwood, which was cleared during the two World Wars for timber and then land for arable farming. We want to return this land back to a wooded landscape connecting up the woods that were cut off from each other almost 100 years ago. Along with the planting of new young trees, we envisage that natural colonisation from the plentiful seed source surrounding the fields will play a significant role in creating a natural and resilient woodland, a woodland for wildlife and a woodland for people. 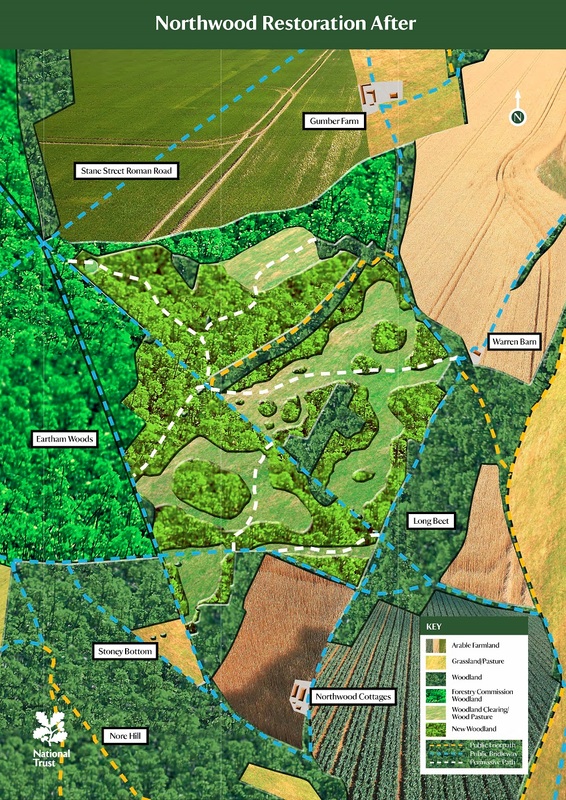 By returning the 75 hectares of land back to woodland it will connect up to a much larger block of woodland of around 600 hectares in a historically wooded area.  The National Trust aim to create……. A Natural and Resilient Woodland. We want to allow natural colonisation to occur as much as possible to develop the woodland but we will also collect seeds from the local area to establish some smaller areas of trees. 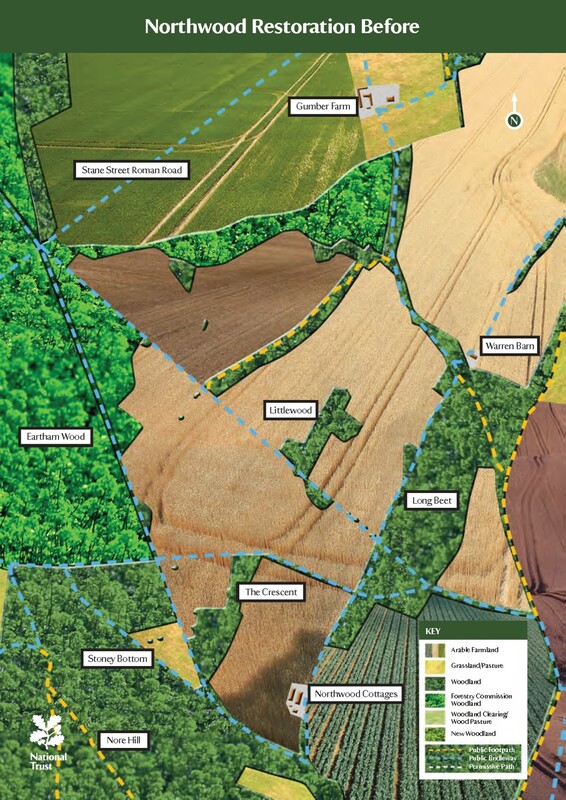 This will provide structurally diverse woodland, which will become resilient to climate change, diseases and pests. Low intensity grazing will be eventually introduced to create a natural environment. A woodland will also provide many benefits to the ecosystem, from carbon storage to ground water protection. The area already hosts many species of wildlife that require woodland conditions. We envisage that the establishment of the woodlands will help their populations increase. There will also be areas of open space through permanent and natural glades, as well as paths that will provide linear corridors. We want people to enjoy the new woodland today and in generations to come by having greater access and by being able to get closer to nature. Also, people will be able to help with the establishment of the new woodland and become part of the legacy. Have a look at our Northwood leaflet for more information. Download it by clicking here or pick up a copy at the Slindon village shop/café – The Forge or from one of our Slindon car parks.